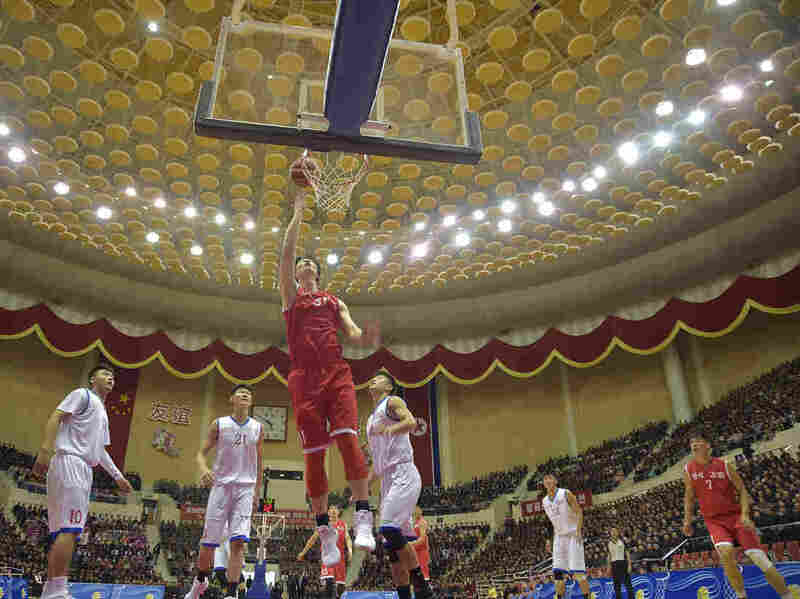 North Korea Promotes Basketball As 'An Important Project' "We must rush to elevate the sport to global levels," North Korea's official newspaper reportedly stated this week. North Korean leader Kim Jong Un has a well-known love for the sport. A joint China-North Korea basketball game in Pyongyang in October. Basketball is apparently being embraced by North Korea as a fundamental part of its ideology. A newspaper there used a "whole page" earlier this week to endorse the sport, South Korean newspaper Chosun Ilbo reported. "Promoting basketball is not only a sports-related matter, but an important project that upholds the objectives of the [Workers] Party," the North Korean paper reportedly stated. "We must rush to elevate the sport to global levels." Incidentally, Kim Jong Un has long been described as a diehard basketball fan. He was reported by The Washington Post to have enrolled at a school in Switzerland in the '90s "with a fake name, a collection of genuine, top-of-the-line Nike sneakers and a passion for American basketball." In 2013, he formed a relationship with retired NBA star Dennis Rodman, who told him, "You have a friend for life." Kim's father, Kim Jong Il, also possessed a love of the sport: He was said to have "regulation courts at most of his palaces plus a video library of practically every game Michael Jordan ever played for the Bulls," the San Diego Union-Tribune reported. In October 2000, U.S. Secretary of State Madeleine Albright gave Kim Jong Il an NBA basketball signed by Michael Jordan – a parting gift on a diplomatic mission. As the United States sought ways to engage with the reclusive country, officials considered sending basketball players to Pyongyang, according to the Post. That never happened, though North Korea sent a basketball player to Canada and asked NBA teams to send scouts to watch the athlete play. In the fall of this year, Pyongang held a friendly match with Chinese players at Ryugyong Jong Ju Yong Indoor Stadium.